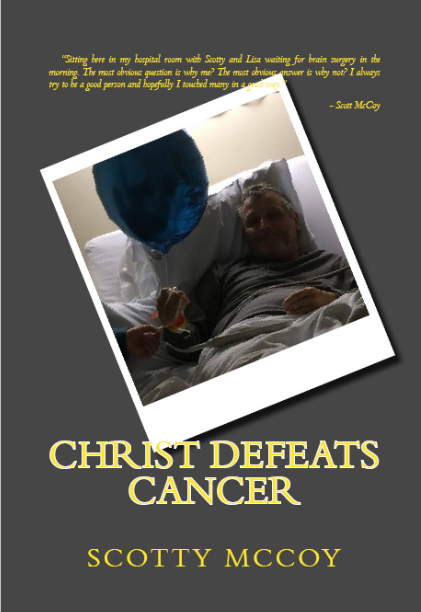 Christ Defeats Cancer is a biographical novel about my dad, Scott McCoy's, miraculous defeat of a rare, aggressive form of brain cancer: Glioblastoma. My dad was diagnosed with Glioblastoma on September 14, 2016 and had to undergo emergency brain surgery. Following the surgery, he had a major setback which was a stroke that should've killed him. After praying, having faith in our Lord, and hope in my dad's will to fight and survive, he received a miracle from our Lord and Savior, Jesus Christ, that even baffled his neurosurgeon. With a foreword written by my dad's neurosurgeon, Dr. Steven Toms, "Christ Defeats Cancer" talks about my dad's year-long battle starting from his initial diagnosis to his ultimate and miraculous defeat of brain cancer. © 2017 “Christ Defeats Cancer” by Scotty McCoy.